In the rear view mirror, Q1 GDP was revised up 0.1% to +1.9%. Monthly data focused on home sales. Both new and existing home sales for May declined slightly from April, but in the longer perspective simply continued to bounce along the bottom they first made two years ago. Durable goods orders fared better, up 1.9% from the previous month. New orders for non-defense capital goods, a component of the LEI, increased 5.8% from the month before. Durable goods may be the first signal that the Japan-induced slowdown in manufacturing is ending. Highlighting the deterioration in tone, the ICSC reported that same store sales for the week of June 18 increased 2.2% YoY, and decreased -0.7% week over week. The yearly comparison here has continued to decrease in the last few weeks. Shoppertrak reported a 1.0% YoY increase for the week ending June 18 and a WoW increase of 8.6%. YoY weekly retail sales numbers had been a bright spot, but comparisons have been slowly weakening. This week marks the first time when same store sales have joined other indicators in signaling a real slowdown. Similarly, the American Staffing Association Index remained flat. The index has been rebenchmarked, so the new value is 87. This series is just barely above a stall, and is a significant danger sign. It is weaker than early 2007, but not trending down as during the recession. Railfax was up 3.2% YoY for the week, or 9,200 carloads. Baseline traffic is actually down -0.14% from a year ago. Cyclical traffic is up 2.24% YoY. Intermodal traffic (a proxy for imports and exports) is up 2.71% compared with a year ago. Railfax continues to flirt more and more with going negative, and has almost done so on a carload basis. The BLS reported that initial jobless claims last week were 429,000. The four week average increased slightly to 426,250. We have stabilized under 430,000, but this is still considerably higher from earlier this year. Adjusting +1.07% due to the 2011 tax compromise, the Daily Treasury Statement showed that for the first 17 days of June 2011, $7109.4 B was collected vs. $115.2 B a year ago, for a decrease of $5.8 B, or -5% YoY. For the last 20 days, $139.2 B was collected vs. $131.6 B a year ago, for an increase of $7.6 B, or 5.7%. Use this series with extra caution because the adjustment for the withholding tax compromise is only a best guess, and may be significantly incorrect. Neverthless, that in the past few weeks some negative YoY comparisons have appeared is emphatically not good. M1 was down -0.2% w/w, up 0.6% m/m, and up 13.1% YoY, so Real M1 was up 9.7%. M2 was up 0.1% w/w, up 0.5% m/m, and up 5.3% YoY, so Real M2 was up 1.9%. YoY weekly median asking house prices from 54 metropolitan areas at Housing Tracker showed that the decline worsened -.2% to -4.7% The areas with double-digit YoY% declines increased by one to 10. The areas with YoY% increases in price decreased by two to 3. Oil finished at $91 a barrel on Friday, which means it is now below the level of 4% of GDP (which according to Oil analyst Steve Kopits is the point at which a recession has been triggered in the past). Gas at the pump fell for the fifth week in a row, declining $.06 more to $3.65 a gallon. Gasoline usage at 9319 M gallons was +.8 higher than last year's 9241. This is the third time in four weeks that gasoline usage has exceeded last year, after a two month period of negative YoY comparisons. In other words, the Oil choke-collar continues to loosen. The Mortgage Bankers' Association reported that seasonally adjusted mortgage applications decreased 2.8% last week. It was 4.4% higher than this week last year. This is the fourth week in a row that YoY comparisons in purchase mortgages were positive. Except for the rush at the two deadlines for the $8000 mortgage credit, these are the first YoY increases since 2007. Refinancing decreased 7.2% w/w with a slight increase in mortgage rates. Ultimately it is the loosening of the Oil choke collar and the bottoming of the housing market in prices as well as sales which will lead to a longer-term, more sustainable recovery in the economy (that, and fixing systemic financial risk and dealing with global wage arbitrage, prospects as to which Versailles has not shown the slightest interest). 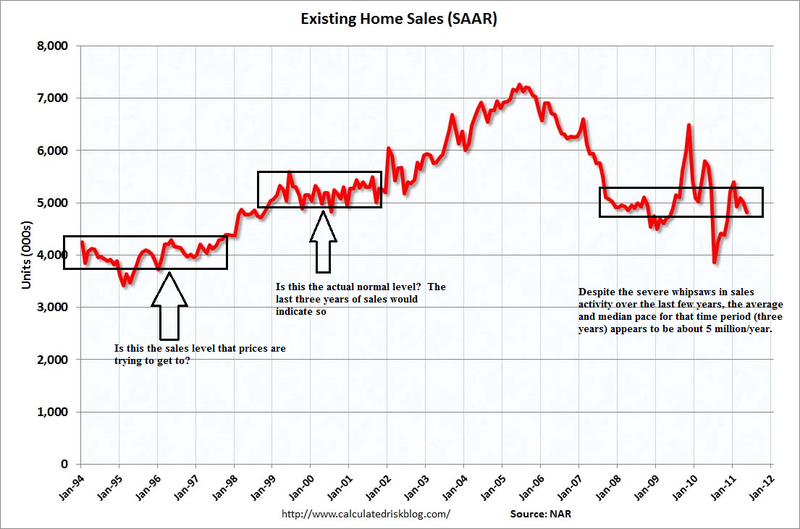 The improvement in housing and oil as shown above is helpful. The concern is that contractionary policy emanating from Versailles will swamp those effects. Since the site's occasional Doomoron troll has posted one of his usual central falsehoods, claiming "Bonddad and NDD were dead wrong in predicting the recovery of employment," it's time to set the record straight. As of the most recent revisions, the turning point was in February/March, only 2 months later than my window. I was off by a grand total of 63,000 jobs lost in January and February. In fact, before the most recent revisions, the 2010 current data showed my prediction to be spot on. By the way, the data looks the same for all jobs if you take out census hires and fires, but there's no graph for that. Since then, every single month has shown job growth - clearly not enough compared with the 8 million lost jobs from 2007, but consistent growth nevertheless. I'll let you decide if that means I was "dead wrong in predicting the recovery of employment" or not. As for our troll's hero, the Pied Piper of Doom, on January 13, 2010 he claimed that the only job growth in 2010 would be that of Census hiring. OOPS! In fact, the highest unemployment reached in 2010 was 9.8% OOPS!! OOPS!! He also predicted in March 2010 that the unemployment rate would not fall below 9.7% at any point in 2010. In fact, unemployment fell below 9.7% in May and remained below 9.7% for all but two of the next 7 months. OOPS!!! OOPS!!! OOPS!!! Facts are very inconvenient things. The above are just 3 of the over 100 false prophecies made by the Pied Piper of Doom about which that I have kept book. His acolytes have to have very big memory holes down which to pour and forget about all of those false prophecies. By no means do I claim infallibility. But by now the facts have put a stake through the heart of the canard repeated by our troll. Let's tie all of this information about unemployment together. 1.) The trend of initial unemployment claims is down. We see this in the 4-week moving average, along with other data such as the Challenger job cut report, the decrease in the number of seasonally adjusted mass lay-off events and the decrease in the number of seasonally adjusted people laid-off in mass lay-offs. Because the number of initial claimants is decreasing, we can expect a slow improvement in the number of people unemployed for various lengths of time. 2.) The structure of unemployment is showing improvement. The number of people unemployed for less than 5 weeks has been decreasing since the beginning of the year. The number of people unemployed for 5-14 weeks and 15-26 weeks dropped in the latest jobs report. The longer term unemployed are still increasing, but given the drops in the other metrics this number should start to show a decrease within the next 4-6 months. So, in the meantime what should we do? 1.) Make sure the longer-term unemployed are given benefits and other help to ease their suffering. 2.) Ask ourselves is there a way we can better implement the stimulus money to increase the rate of GDP growth and thereby see a faster drop in GDP? As NDD has pointed out above, we started to see job increases in the first quarter of 2010. In addition, if you look at the way the recovery has unfolded, it has done so more or less in line with what I wrote in the First and Starts Expansion. And, I should also add that both NDD and I have advocated for the creation of a new WPA, along with highlighting the importance of maintaining our infrastructure. See here, here, here, here, here and here. None of this will of course appease the trolls, but then nothing ever will. Congressional Republicans on Thursday abandoned budget talks aimed at clearing the way for a federal debt limit increase, leaving the outcome in doubt as they vowed not to give in to a Democratic push for new tax revenues as part of any compromise. Mr. Cantor had previously expressed optimism that the sessions could produce a deal. But he announced he would not be attending Thursday’s scheduled meeting because Democrats continued to press for part of the more than $2 trillion savings target to come from moves like phasing out tax breaks. Senator Jon Kyl of Arizona, the No. 2 Senate Republican and the party’s other representative in the talks, said later Thursday that he would also skip the next negotiating session as he and Senator Mitch McConnell of Kentucky, the Republican leader, turned up the pressure on President Obama to play a larger role in the push for a debt limit deal. OK -- let's do something really radical right now like look at data and facts. 1.) Treasury debt is bench mark debt -- meaning it forms the foundation of the fixed income market. To play with this market in anyway invites extreme, economically dislocating problems. 2.) The US is running a trillion dollar plus deficit. That means the only way to solve the problem is with a combination of spending cuts and tax increases. Neither solution in isolation will solve the problem; it's mathematically damn near impossible. 3.) The GDP equation is very clear: government spending contributes to economic growth. And as the CBO clearly illustrates in its historical budget data, government spending has accounted for between 19% and 23% of US GDP for the last 30 years. This is an utterly pointless situation at this point. In case you're wondering, I still think Bernanke has the best solution for the current situation. Last week, I observed the dollar appeared to be forming a bottom. Quoting an article from Forex Blog, I noted the dollar was acting somewhat contrary to what we would anticipate: stronger economic data had led traders to a "risk on" strategy, which meant selling dollars while softer economic news led to a "risk off" strategy, meaning dollar purchases. 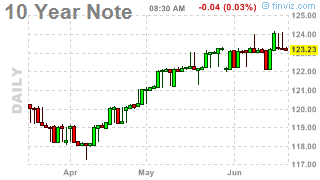 In addition, as the euro has weakened over the last few weeks, the dollar has been the beneficiary. On the longer chart, notice that prices have moved through resistance, only to drop back. 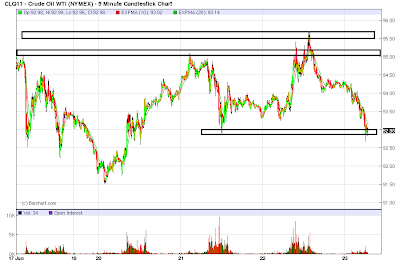 However, prices again are bumping up against key resistance. Prices are also forming a consolidating triangle. More Americans than forecast filed first-time jobless claims last week and consumer confidence fell, highlighting Federal Reserve Chairman Ben S. Bernanke’s concern that the slowdown in the economy may persist. Applications for unemployment benefits increased 9,000 in the week ended June 18 to 429,000, Labor Department figures showed today. The level of claims exceeded the highest estimate in a Bloomberg News survey in which the median projection called for 415,000 filings. The Bloomberg Consumer Comfort Index dropped to minus 44.9 last week from minus 44. Several factors are at play in the uneven global economy. One is a big rebalancing that many economists believe has been long coming. China and other developing economies have depended on exports to the U.S. to fuel their growth. Meantime, U.S. consumers feasted on cheap imports. In the process, China amassed a large trade surplus and the U.S. trade deficit soared. Global growth appears to be shifting, with the U.S. consuming less and exporting more, and the opposite happening in places like China. While healthy in the long-run because it reduces these imbalances, the change is proving to be highly disruptive, especially to the U.S. economy, which depends so heavily on domestic consumption. Let's place this paragraph in perspective, as it says a great deal about what is happening internationally. 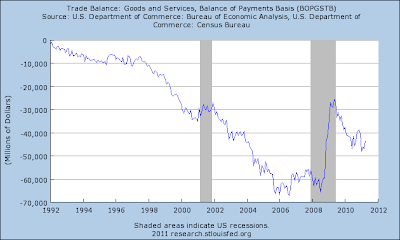 Above is a chart of the US' trade balance, which clearly indicates we are a net importer, and have been for some time. However, the recession greatly slowed our imports, and while the situation has worsened somewhat since then, it has still improved from the 2006-2008 position. 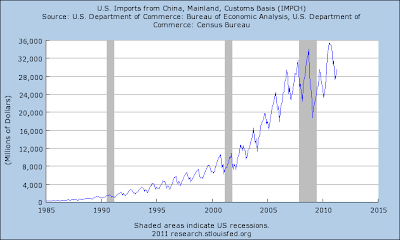 Above is a chart of Chinese imports. While it has rebounded from the drop we saw during the recession, it's rate of increase is clearly slowing. There are many reasons for this. The biggest is China no longer provides as strong a labor arbitrage as before, largely because their middle class is growing. 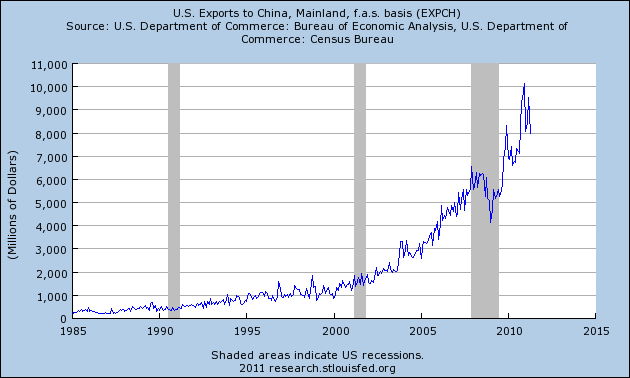 The above chart is perhaps the most important, as it shows a strong increase in US exports to China since the start of the latest expansion. There is still a vast difference which clearly favors China. However, the above chart shows that US manufacturing is helping to decrease the difference. As NDD has already noted, households continue to de-leverage as well. This is one contributing factor in the slower pace of US consumption. Also adding pressure to US consumers are higher commodity prices and weak wage growth. While consumers are still spending, they are not spending as much as they did. The US has a lot to do in order to catch-up with Chinese imports. But, we are clearly starting. In addition, US consumption is slowing, helping to lower demand for Chinese imports. But, the rebalancing process is very slow. 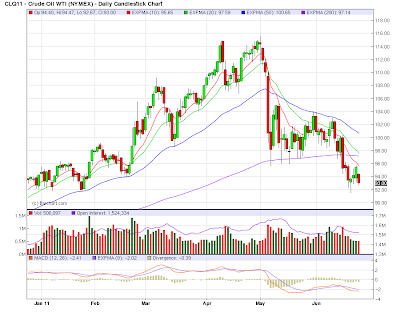 Oil prices have clearly moved through technical support and are now resting in the 92-94 price area. All the EMAs are moving lower and the shorter EMAs are below the longer EMAs. Prices are using the EMAs for technical resistance, another bear market characteristic. Momentum is weak. But most importantly, prices are below the 200 day EMA, the line delineating the difference between a bull and bear market. 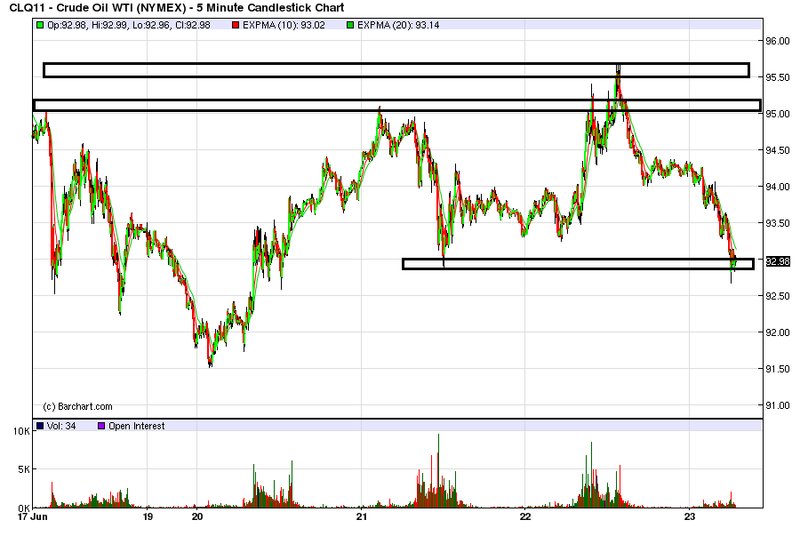 On the 5-minute chart, the 95/95.5 are is providing upside resistance. 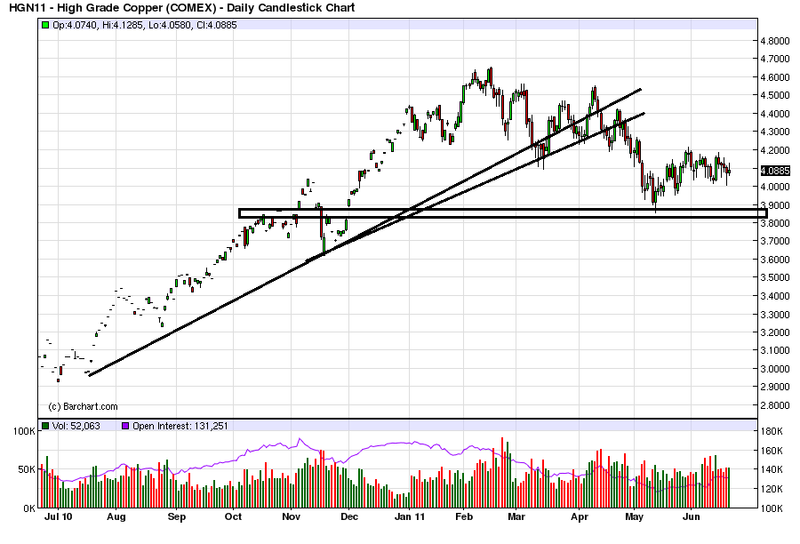 This was the lower boundary of previous support. The 93 area is providing short-term support. However, the primary trend from last week is one of sideways consolidation. The oil market is caught between two different issues. In the short-term, there is concern about the pace of expansion. Lower growth = lower oil demand = lower prices. However, as I pointed out above, there has been a strong, fundamental, long-term shift in the world's oil demand as countries like India and China have grown with their demand has supplementing US/EU demand, providing a long-term floor under prices. But currently, these countries are also tying to slow growth due to increased inflationary pressures within their respective countries. In other words, there is currently a great deal of negative sentiment weighing down oil prices. Click for a larger image. Thanks to Calculated Risk for the chart. 1.) Over the last three years, despite the whipsaws created by the approaching tax credit expiration and subsequent expiration -- the median and average pace of sales appears to be in the 5 million/year range (I'm eyeballing the chart to make a point). This is despite the worst housing market in about 50 years. 2.) The current sales pace is more or less equal to the sales pace from the early 2000s. 3.) In the mid 1990s, the average/median sales pace was about 1 million homes/year less, coming in about 4 million. I doubt this is the level that sales are moving towards. If they were going to move to this level, they already would have done so. 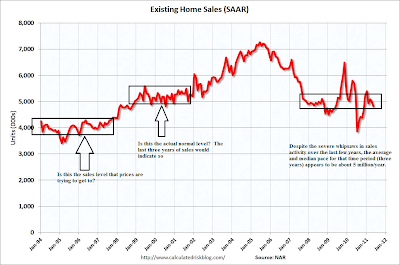 Here's the point: to my eyes, existing home sales have hit their primary pace for this expansion. One of the items I always list in my "Weekly Indicators" column is BAA corporate bond yields. Since yesterday I wrote about the existence of economic indicators in the pre-inflationary era before WW2, it's worth revisiting that data, including BAA corporate bonds,because one of the reasons I added it to my list is precisely because we have good data on corporate bonds (both AAA and BAA) for almost a century - since 1919. BAA bonds have shown more reaction to economic conditions, so that is the series I track. Note that, with the sole exception of the 1927 recession, BAA (i.e., lower grade) corporate bond prices began to fall, and their yields rise, in advance of the onset of a deflationary recession, and then continued to rise as corporate creditworthiness became more risky during the recessions. BAA corporate bond yields also typically began to decline in advance of the end of the recessions. In short, they functioned as a leading indicator. Now let's look at BAA corporate bonds for the last 10 years. Note that there is the same pattern in advance of and during the "great recession" of 2007-09. BAA corporate bond yields began to rise in 2005 and continued to rise as risk of corporate defaults increased during the recession. Yields declined in advance of the bottom of the "great recession" in 2009. Once again, they functioned as a leading indicator. Now, take a look at the far right end of the graph above, showing 2010 and 2011. Do you notice the rising bond yields in anticipation of worsening corporate creditworthiness? No? Well, neither do I. Publicly available leading economic indicators from the pre-inflationary era are not non-existent. Over the next week, time permitting, I'll post some more series that go all the way back to the 1920s or even 1910s. President Obama will talk about troop numbers in Afghanistan when he makes a prime-time speech from the White House on Wednesday night. But behind his words will be an acute awareness of what $1.3 trillion in spending on two wars in the past decade has meant at home: a ballooning budget deficit and a soaring national debt at a time when the economy is still struggling to get back on its feet. I was against the Iraq War from the beginning -- not for a higher reason such as wars are inherently immoral -- but instead for purely economy reasons: wars are expensive. And when the US got into Iraq, they did nothing to actually pay for the war effort. As the article notes, we've spent $1.3 trillion dollars on the two wars over the last 8 years. It has gotten us nothing. And this at a time when all that money could have been pumped into the US' sagging infrastructure. In short, ending the wars ASAP will at minimum end the drain they are putting onto the federal budget. 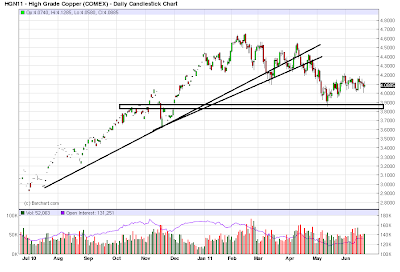 Today, I'm going to look closer at the copper market because it's a good harbinger of the economy. Let's start with the one year chart. The primary point made by the one year chart is prices have broken a long-term uptrend. However, also note that from a long-term perspective prices have not dropped as sharply as anticipated given the overall weakness of the current economic numbers. On the shorter chart, prices have continued to move in a down, up, down pattern. Notice the disciplined manner of the sell-off; prices have not collapsed in a massive sell-off, but have instead moved in a disciplined move lower. For the last several weeks, prices have moved sideways. Also note the 10 and 20 day EMA are now moving sideways, and both EMAs are entwined with the other. The MACD indicates momentum is fair. There chart says traders are in a wait and see mode. Overall, this is really not a bad chart. Although China and India are raising rates, Japan is just starting to dig out from the earthquake and US manufacturing is slowing down, prices are still only down about 12%. Given the macro backdrop, the lack of a price collapse is very good news. Is the Stock Market Over Sold? 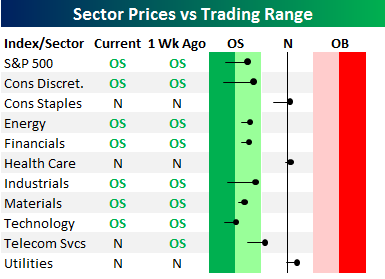 The chart to the right summarizes where the S&P 500 and each of the ten sectors are trading relative to their normal trading ranges. For each sector, the circle represents where the sector is currently trading while the tail represents where the sector was trading one week ago. When the circle is in the pink or red area it is considered overbought, while the green areas indicate oversold levels. While the bond market has benefited from increased concern about the EU area and the US' economic expansion, the upward rally has stalled for the last month-month and a half. While the inverse relationship between stocks and bonds is not perfect, it can be a telling indicator. I am not sure why [Prof. Shiller] is alarmed in spite of forecasting models' non-pessimism. So let me tell you why I am alarmed [despite the models' non-pessimism]. One way to think of large-scale forecasting models is that they are essentially vector autoregressions surrounded by a shell of behavioral equations and accounting relationships. The purpose of the equations and relationships is to trigger alarm bells in your mind when you look at the vector autoregression forecast--and then decide whether or not you want to incorporate an add factor. This methodology does, I think, work pretty well for forecasting: it works much better than a poke in the eye with a sharp stick, for example. But the underlying VAR correlations still largely come from an age of inflation-fighting recessions and rapid bounce-back. Thus that is an input to what the markets are forecasting. And is that input still valid for today? That is why I am alarmed. It is puzzling to say the least why Prof. Delong, a student of economic history, is not aware of whether or not forecasting models would operate in pre-WW2 deflationary environments. Most notably, Columbia University Prof. Geoffrey H. Moore spent an entire career gathering data and building indices of leading indicators. When his Institute left Columbia, he founded the Economic Cycle Research Institute (ECRI), which has been very much in the news since their gutsy March 2009 call that the "great recession" would bottom sometime that summer. Please note that, contrary to what most bloggers assume, ECRI’s leading indexes are not based on back-fitting of data to “garden-variety” postwar recessions. Rather, they go back over a century and, with no recourse to data fitting, can be shown to correctly anticipate the “jungle-variety” depressions, panics and crises of the early 20th century, as well as the recoveries from those extraordinary events. )While ECRI's index is proprietary, I have to think that much of Prof. Moore's work, including papers on downturns that preceded the post-WW2 inflationary era, are accessible to Prof. Delong. Thus the claim that at least some forecasting indices do not cover eras like the Great Depression appears simply to be wrong. [D]uring the entire period of the Great Contraction of 1929-32, the ONLY time that all three monetary/financial elements of the LEI would have been positive, would have been in September 1931.
building permits were presumably also negative throughout the 1929-32 period, except possibly at the very end. at no point did either the monetary or the yield curve indicator give a false signal. When either one was triggered, a recession followed. As I have previously indicated, all the deflationary recessions followed a pattern. The CPI declined from the beginning of the recession and its YoY rate of decline bottomed immediately before the recession's end. M1 followed a similar pattern, sometimes coincidentally, sometimes leading slightly. Like a roller coaster reaching the bottom of a decline, the indicator that the bottom is at hand is that the coaster continues to decline, but declines at an ever decreasing rate! In all 6 of the deflationary recessions during our study period of 1920-50, once M1 and CPI both declined at a decreasing rate, the recession was about to end. Indeed, if one entirely backs out the yield curve from current readings of the the LEI, the LEI still only show a stall, not a downturn. Prof. Delong has written extensively in the past several years about the failures of the economic profession. If he believes that post-WW2 business cycle indicators are inadequate, then why hasn't he devoted time and effort to working with the prewar data? After all, Milton Friedman already wrote a Nobel-prize winning book about exactly that data ("A Monetary History of the United States"), and it isn't as if other financial data such as bond rates, housing starts, industrial production, and bond rates are unavailable. For my part, it is largely bacause of the extensive work I put into dissecting pre-War deflationary era indicators that I believe the economy will be resilient once energy prices stay reasonably moderate, real money supply is positive, and the yield curve is strongly positive. Only strident, deflationary, contractionary economic policy coming from Washington is sufficient to cause me concern that the economy could tip into any prolonged deflationary bust. I track four broad markets: equities, treasuries, commodities and currencies. I do this because -- thanks to ETFs -- we can now trade in these broad based asset categories. In addition, each of these commodities has a different part of play during different parts of the economic cycle. So, let's look at the price action over the last few months to get an idea for the picture that traders are seeing of the economy. Equities: Equities are a leading indicator of economic activity (they hold a 3.7% weighting in the Conference Boards leading indicators). The reason is simple: traders will start to bid up shares in advance of an economic rebound as they anticipate recovery. They will be looking for various indicators regarding the future expansion on which they will base their trades. Right now the markets are in the middle of a sell-off which has also occurred at the same time economic numbers have been weakening. This tells us that traders are doing two things. First, they are taking profits off the table. Remember -- the rally has been occurring for over a year now; for traders that got in near the beginning, the rally is getting long in the tooth. Second, they are selling into the weakness of the economy, waiting for further confirmation regarding the economic direction. 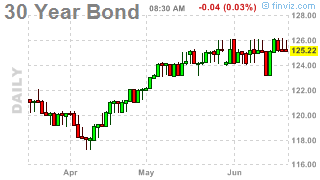 Bonds: the bond makes has been rallying for the last few months. Bonds rally for several reasons. First, low inflation expectations. Inflation eats away at the return on bonds, so high inflation leads to low bond prices (and higher yields). The low bond yields tell us inflation is not a concern. Second, the rally indicates there is little concern the Fed will be raising rates anytime soon, as a rate hike would lower the value of currently issued bonds. Third, the rally indicates people are concerned, largely with the EU situation, but also with the pace of the US expansion. In short, bond rallies are not good harbingers as they indicate people are concerned with the economic expansion. Oil: Once oil moved through the 96/98 area, prices dropped hard. This tell us that traders are concerned about growth prospects as well. Remember -- strong growth means higher fuel demand while weak growth means less demand. In addition, technically speaking, prices are now below the 200 day EMA, which is the standard line between a bull and bear market. Gold: There are two primary drivers of gold demand: inflationary concern and overall economic concern or uncertainty. From an inflationary perspective, it's important to note that gold prices have not moved above previous highs. In fact, while still in an uptrend, momentum (the MACD) is showing an overall decrease. I believe the inflationary buy is less important right now, an argument which is furthered by the Treasury market rally (if the treasury market were concerned about inflation, we'd be seeing a sell-off). However, I also think the uncertainty trade is still a big part of the gold trade, and uncertainty is currently very high. So I believe the gold market indicates uncertainty is high. Dollar: the dollar is still considered a safe haven. Thus, while we have seen the tensions regarding the EU situation increase, the dollar has benefited. 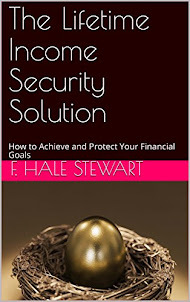 In addition, the US overall is still considered the safest place to invest, which has provided support for the dollar. The drop in equities signals a concern for the overall macro-environment which is confirmed by the Treasury rally. Inflation isn't a concern, but uncertainty is. In short, the unknown is a big issue right now with most everybody in the market. The economic numbers are weakening, but we're not seeing enough information to warrant a total sell-off. The overall IEF chart -- like the TLT chart -- is positive (with the same criteria). However, notice that prices are bunched over the last week or so. And the last two days have printed very weak candles with a possible MACD sell-signal on the way. The MACD and price action is giving me pause. While these are not definitive sell-signals, they are chips in the armor. If you've made a profit, take it. Even a fifth consecutive year of record global corn harvests will fail to meet demand for food, fuel and livestock feed, reducing world stockpiles to the lowest in two generations. Consumption will rise 3 percent in the next marketing year, a 16th consecutive annual gain that saw demand jump 66 percent, according to U.S. Department of Agriculture estimates. Inventory will drop to 47 days of use, the fewest since 1974, the data show. Waterlogged fields in the U.S., the largest exporter, will curb yields, Goldman Sachs Group Inc. says. Corn may jump 36 percent to a record $9 a bushel if conditions worsen, Morgan Stanley says. Corn purchases are accelerating as droughts and floods limit output gains in everything from soybeans to wheat, driving the Standard & Poor’s Agriculture Index of eight commodities 60 percent higher in 12 months. China, the world’s second-biggest consumer after the U.S., will use 47 percent more than a decade ago, adding an amount greater than the entire crop of Brazil, the third-largest producer. Both debt service payments (blue line, left scale) and total financial obligations (red line, right scale), are now less than about 3/4's of the last 30 years -- all but the early 1980s and a few years in the early 1990s. If this rate of decline continues, then by the end of this year, both of these will be near their all time lows, and may surpass them by next spring. Prof. Brad Delong is the latest prominent economist to label the period of Hard Times we are in a "depression." Prof. Paul Krugman has suggested several times that the period we are living through may be comparable to the post-1873 "Long Depression" that may have lasted over 20 years. Prof. Delong had previously insisted on 10%+ unemployment to label a period a "depression" but acknowledged admittedly that he was "moving the goalposts" to 9%+. He thereupon relabeled the "great recession" and our subsequent recovery, "The Little Depression." Previously I have discussed the inadequacy of economic business cycle terms. To economists and other financial professionals, "Recession" and "recovery" mean, respectively, declining economic activity and increasing economic activity (that has not yet reached its previous peak). To ordinary citizens, however, "recession" conveys hard times, whereas "recovery" means the beginning of good times. In other words, one group measures the change in activity, while average citizens are more concerned about its level. It would be really helpful if professionals developed and agreed upon terms that reflected the common concern with the level of activity as well. The ad hoc usage of depression and the refusal to apply the previously agreed term of recovery for improvement off the bottom clearly show the need for such vocabulary. But let's accept that, in terms of the level of unemployment and economic activity, the period since December 2007 to the present should be called a "depression." If that is true, however, then why shouldn't the period from 1974 through 1987 also be labeled a depression? The unemployment rate throughout this period was consistently high. Unemployment exceeded 6% from October 1974 through August 1987 for all but 4 months in 1978 and 9 months of 1979. It exceeded 7% from December 1974 through July 1978 and with one exception again from May 1980 through October 1986. It exceeded 8% from all during 1975 and again from november 1981 through January 1984. Finally, there was 10%+ unemployment from September 1982 through June 1983 (vs. only one month of 10%+ unemployment in 2009). Thus, only by specifically selecting 9%, as to which there were 18 months of higher unemployment in 1982-83 vs. 24 months from 2009 to the present can Delong make the case that the current period is worse. In summary, the 1974-87 period is about the same in terms of the unemployment rate so far, but was considerably worse both in terms of real hourly income and decline from previously trending GDP. So if Profs. Krugman and Delong believe we are in a depression now, why weren't we in a depression then? After leading up to a sell-off the markets have now started to clear out the dead wood. 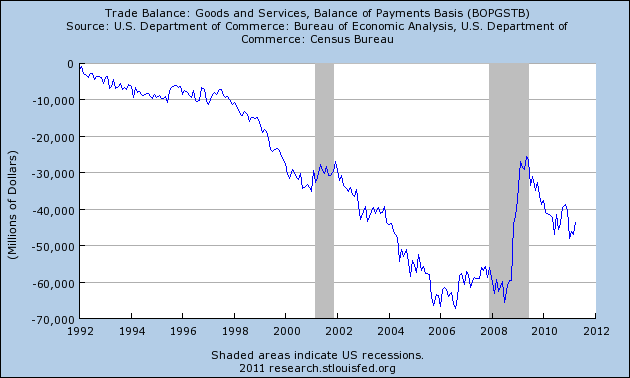 Concern about the pace of economic recovery has been building, so this sell-off should not be considered out-of-place. 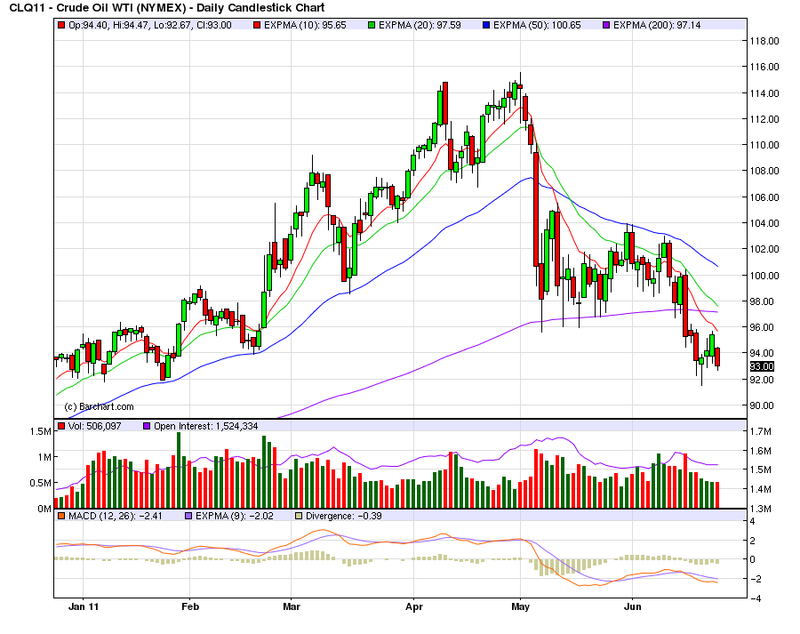 The real test going forward will be the reaction to prices as they approach the 200 day EMA. 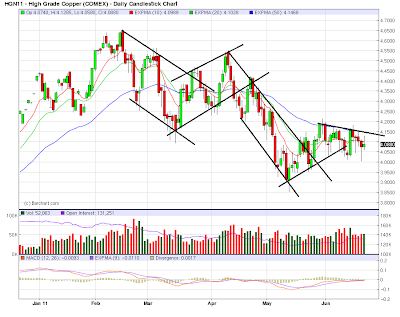 A strong break through that technical area would be a major trading event, and confirmation of a stronger move lower. However, as I'll show throughout the week, the Beige Book does not show an economic catastrophe in the making, but instead an economy simply slowing. I think the more likely action is prices holding at the 200 day EMA to "catch their breath," as it were. However, for those who took my advice and shorted last week, place your stops so there is still a profit if triggered. I've included this long-term chart to illustrate that key Fibonacci levels are below the 200 day EMA. The overall market picture has been decidedly negative for the last few weeks. Prices are in a clear downtrend, and all the EMAs are moving lower. Also note the shorter EMAs are below all the EMAs, prices are below the EMAs and prices are using the EMAs as technical resistance. All of these factors are negative for the market. However, notice the uptick in overall volume as prices hit the 200 day EMA. This could be an indication of a selling climax for this sell-off, as prices now use the 200 day EMA for technical support. All of the technical indicators are negative: the A/D and CMF indicate that money is leaving the market and the MACD shows momentum is declining. The QQQQs have moved through the 200 day EMA.